Coating performance demands that a coating be uniform, smooth and perform as per desired characteristics. Since coatings are a blend of solid and liquid components, certain type of process equipment is used to make sure that the solids in the final coating have the desired and uniform size and are totally wetted out. Most of the architectural, industrial and automotive coatings use either of the following process equipment to incorporate solids in the liquid. These are used as the first stage processing equipment to manufacture a coating. They are the simplest in construction i.e. 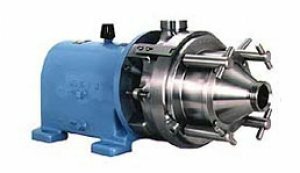 similar to propeller type agitators except they use a saw tooth impeller disk to ensure thorough wetting of solids and their incorporation in the surrounding liquid. Most of these dispersers have variable speed drives. Combination of speed and disk configuration allows them to wet the solids and reduce the particle size. Most of the blades are of stainless steel but in abrasive applications high density polyethylene disks of special configuration can be used. A wide range of product viscosity may be processed, limited only by the maximum 150 psig (10 bar) inlet pressure. Higher viscosity products are processed at lower flow rates to stay within the pressure limit. Combines product recycling and shear action that can be "tuned" to produce precise effect desired. A choice of modularly interchangeable stators and rotors makes it versatile for processing a wide variety of products.